Hallo again! I am sorry for the couple of month’s absence – I have, amongst other things, been holidaying in Berlin, doing a bit of freelance consultancy work and conducting a survey of the youth drama sector in Northern Ireland (findings to be discussed in my next post). 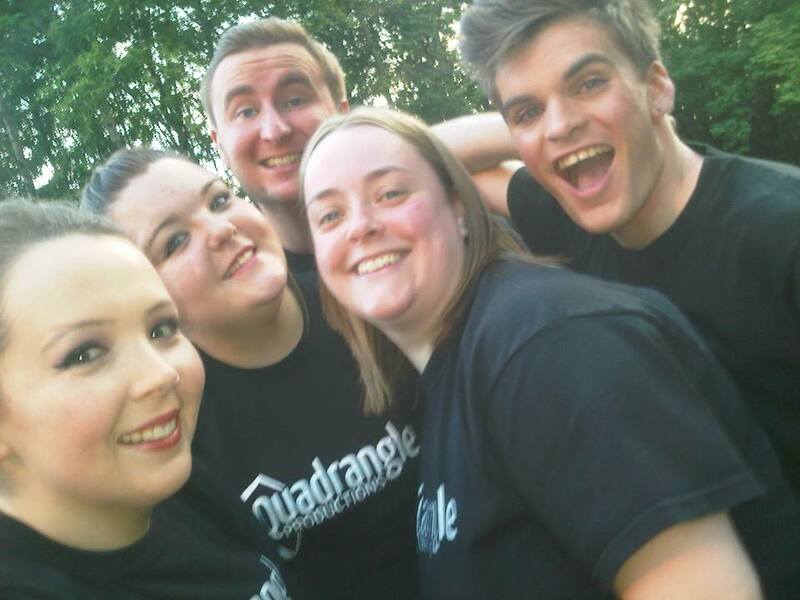 I have also had the privilege of watching the summer show of a cracking rural youth theatre which is very close to my heart: Quadrangle Productions. As Quadrangle take a well-deserved break in 2015-16, I’d like to pay tribute to the vision, imagination and drive that has propelled them through the past five years. Quadrangle Productions is the brainchild of Drama Facilitator Caroline McAfee. Like me, Caroline grew up in rural North Antrim at a time when the only youth drama provision was the school play, elocution lessons or Speech and Drama classes. Again like me, Caroline was accepted onto the National Youth Theatre’s summer training course at age 16, an experience which blew her mind and decided her career path. Upon graduating with a Drama degree from the University of Ulster, Caroline returned to Ballycastle with a determination to provide the kind of creative outlet for young people which hadn’t been there when she was growing up. There was a thriving Amateur Drama scene in Ballycastle at the time, but they tended only to bring young people in if needed for specific productions. Having been part of the Am Dram scene there myself, it’s fair to say that it was also a tad snobby and cliquish. 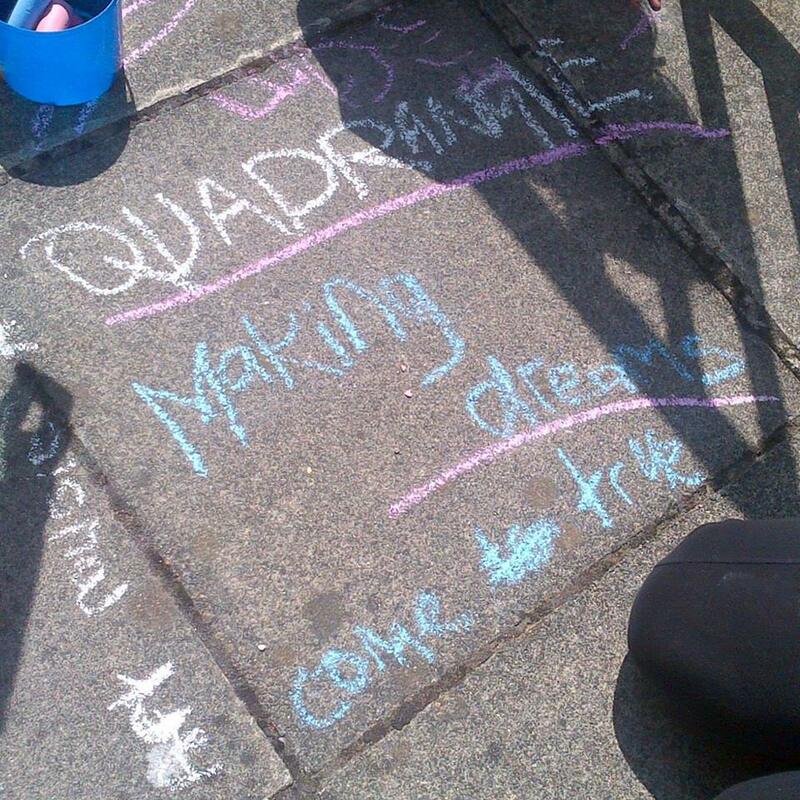 Quadrangle was established in early 2010 and five young people turned up at its inaugural meeting. 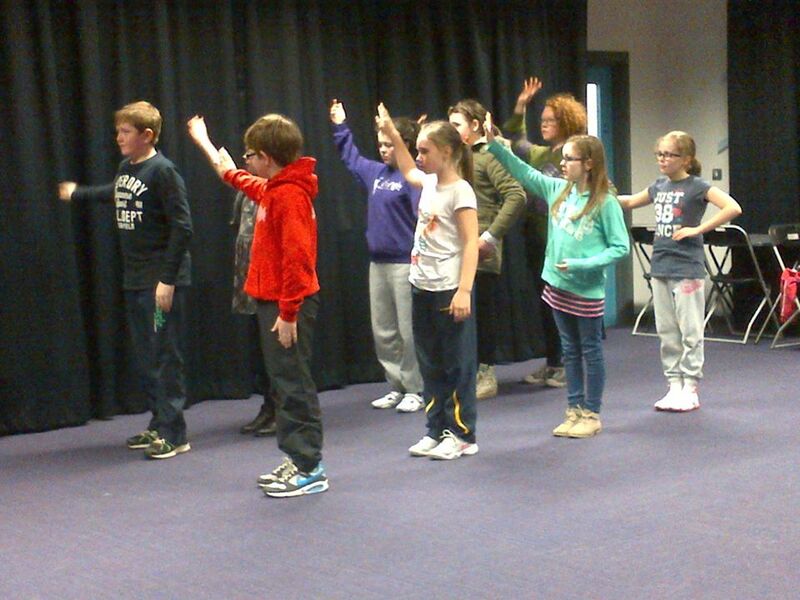 At first they rehearsed in the Scout Den which has “a tiny stage, like two kitchen tables” and a problem with damp. Their first production, a variety show called The Big Bang, was a huge success in terms of inspiring other young people to join the group. By 2011 Quadrangle had nineteen members, and secured a local parish hall as its regular base for rehearsals and most performances. As well as productions staged in this hall, Quadrangle have also staged two shows in The Riverside Theatre, a site-specific play in Bonamargy Abbey and many creative ‘happenings’ at local community events. Looking back over Quadrangle’s history, I am mightily impressed by the variety of styles and art forms which they have been involved in. There was the thoughtful, funny documentary about conducting Polish, Indian and Chinese dance workshops in rural North Antrim. There was the side-splitting Christmas panto of Cinderella (I still get the giggles when I think of the ugly sisters dancing to Beyoncé’s ‘All the Single Ladies’!). There was the series of devised plays by senior members which were performed in a ruined abbey…The list continues. At the last variety concert alone there was an agit-prop play about the cheap clothing industry, a Bollywood dance routine, a piece of abstract theatre about perceptions of young people in society, a contemporary dance routine choreographed by a senior member and a series of comic duologues. When they could have easily stuck to scripted plays or a songs-from-the shows format, Quadrangle decided instead to broaden young people’s frames of reference by introducing them to as many different styles and art forms as possible. Some of their work has been artistically brilliant; some a little weaker; but they have never shied away from jumping in and giving things a go. I should emphasise that over its five years in operation, none of Quadrangle’s leaders have ever taken any payment for their work. The fees for members are £10 a month and all profits are invested back into the group’s activities. Caroline, her husband Dominic and the other facilitators all work day jobs and give up their Saturday afternoons to run the classes, plus a considerable amount of admin and prep time too. My very favourite thing about Quadrangle is the extent to which they nurture individual members. Their Statement of Values includes the sentence: “The company celebrates the equal right of each individual to creative self-expression.” Every production of theirs which I have seen has included elements which have been written or devised by members, and these members’ contributions have been properly recognised. There are few lead roles and all young people tend to get equal time onstage. More than that, you can tell how the facilitators have spent time drawing out and nurturing individual talents which might not have otherwise seen the light. For example, in their last show a 15-year-old boy stilled the room with his beautiful rendition of It’s Time by Imagine Dragons. It transpired that fellow group members had heard him singing to himself during downtime, and Caroline had encouraged him to share his considerable talents in public. 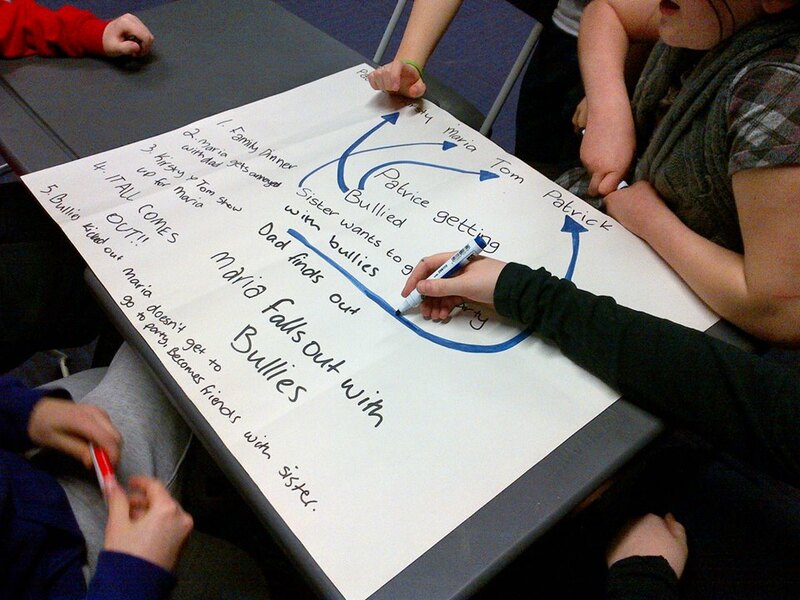 Young people’s ideas are listened to and respected: Caroline described how, with a few weeks to go before the show, Junior members decided that the short play which they had been preparing “wasn’t working for them.” Instead of pushing them to perform something they weren’t happy with, Caroline gave them creative space to prepare something different – which ended up being brilliant. The phrase “something different” has a particular meaning in North Antrim. It’s often employed with a certain degree of reserve, to refer to any activity which is a bit out of the ordinary. For example, if a couple were relating their choice to spend an evening at the theatre rather than the pub, their friends might comment: “Aye. Something different.” The phrase doesn’t have negative connotations, but it recognises that Glens’ society has a certain level of shared experiences (sport, religion, pubs), and that some activities fall outside of this sphere. 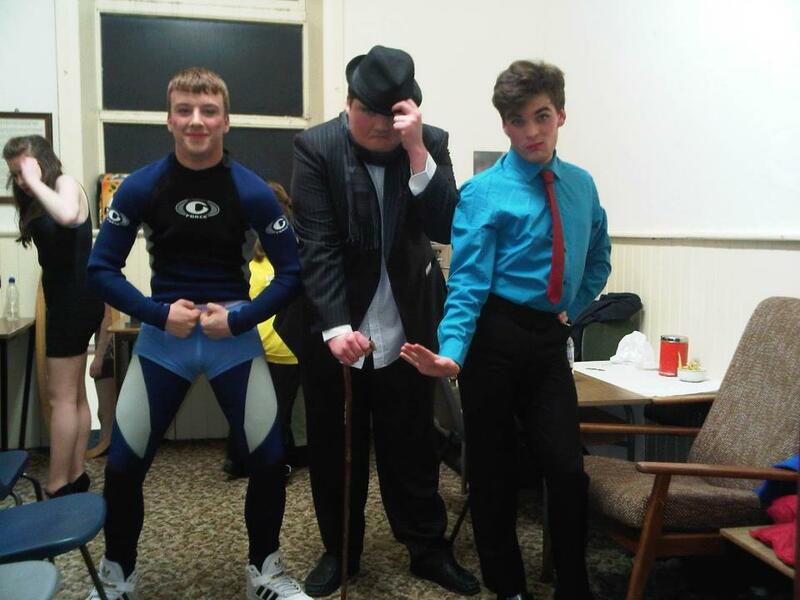 As the only youth drama group in the town, Quadrangle definitely provides ‘something different’ for Ballycastle. 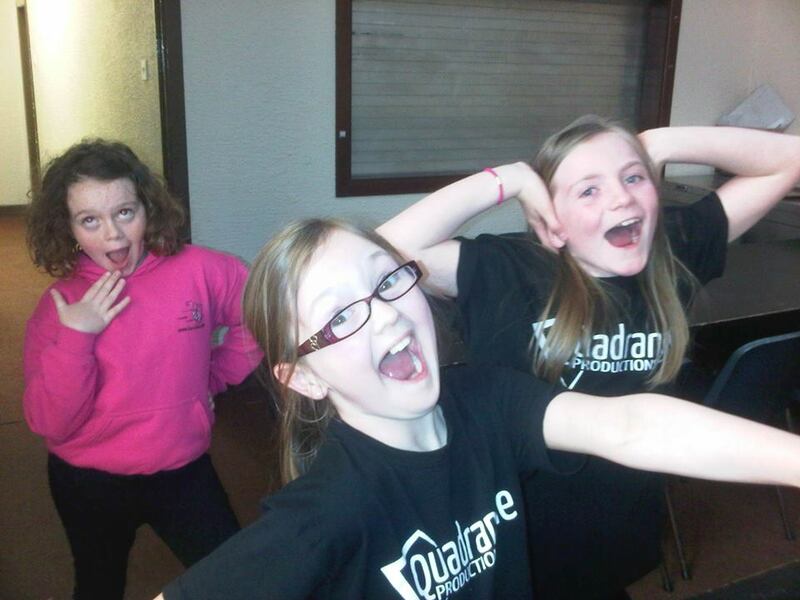 Its mission is to: “ensure that all young people in Moyle have access to quality drama training, and to provide a sustainable platform for these young people to showcase their talents.” Quadrangle has provided a home for young people who aren’t necessarily into sport – which is still the most favoured and valued youth activity in the town. These are young people who want to be a little bit different, to flex their imaginations, to develop identities which may not be what others expect them to be. Two Quadrangle alumni have moved on to study drama at university and another is studying Dance. Many other members have told me of how Quadrangle helped them grow in confidence, value their own creative abilities and broaden their horizons. These are benefits which will stay with them for life, whatever job they end up doing. 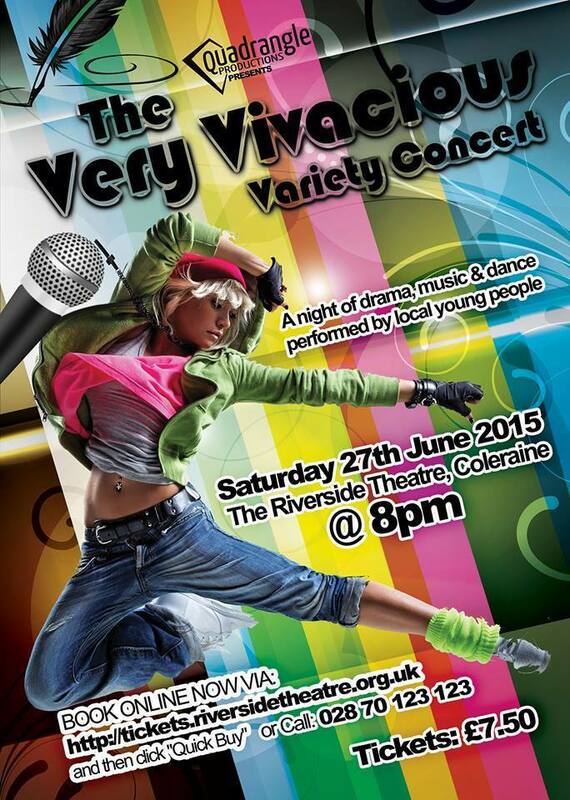 And of course, Quadrangle provides great productions for the local community to enjoy. Theatre Critic Lyn Gardner wrote recently that: “The show that is presented in a village hall is a manifestation of a much deeper network of relationships.” I have seen at first hand how Quadrangle productions have helped to build social capital in Ballycastle, giving local audiences a space to laugh and dream during the long winter months, and providing a real positive platform to change perceptions of young people. Why on earth, I hear you ask, is Quadrangle ending then? My answer: it’s not ending – they are just taking a wee interval whilst Caroline completes a PGCE. After five years of voluntary activity, receiving no external funding and raising all resources through fundraising and in-kind donations, the facilitators are understandably in need of a little break. And although the weekly classes will stop for the year, they will still be doing a Christmas panto, which I for one am very excited about. I feel honoured to have seen Quadrangle grow and thrive over the years, bringing imagination, colour and ‘something different’ to my home town. Quadrangle members past and present, please ‘keep her lit’.